Is my reasoning for this probability question correct? Consider a game of three. You shuffle a deck of three cards: 1,2,3. You draw cards without replacement until total is 3 or more. You win if your total is 3. 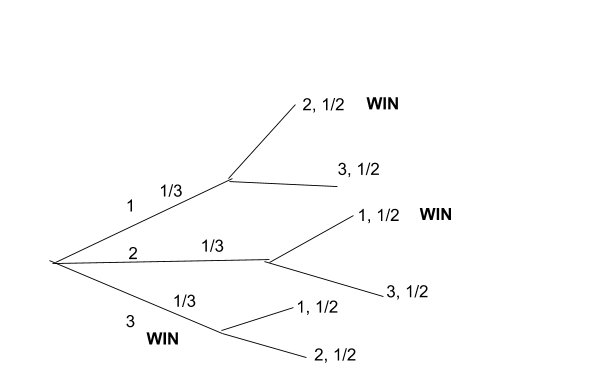 What is P[W], the probability that you'll win? (1/3)(1/2) + (1/3)(1/2) + 1/3 = 2/3. Is this right? Morning after. Had a chance to go to photoshop. This should be the tree. Originally you overlooked that the last branch ($3$ is the first card) was a win. Your new image is better but now it has the branch extending so that you are drawing after you've already won. Obviously once you win, you stop playing. Without drawing a tree, you can reason as follows. Since the game stops when the accumulated value of all cards drawn (which I will call the "score") is at least $3$, the only possible stopping states are when the score equals $3$, $4$, or $5$. It is not possible to score $6$ or higher because the minimum attainable score after drawing $2$ cards is already $3$; thus at most two cards are ever drawn. Since the only way to score $4$ is $(1,3)$, and the only way to score $5$ is $(2,3)$, and each of these occur with probability $1/6$, being among equally likely elementary outcomes of drawing two cards from a pile of three without replacement, it follows that the desired probability is $1 - 2(1/6) = 2/3$. Yes, you are correct. Another way of looking at it is the only way you can win is if 3 is either the first card or the third card. The reason is that if 3 is first you win straight away. If it is not then you have either a one or two in which case a three would be a loss so you must draw the other card (two or one) next leaving the three as the third/last card. Given your shuffle each card has an equal probability of being in each of the three positions so you have a 2/3 chance of winning. How can I calculate the probability of drawing a certain card as I repeatedly draw new hands? What's the probability to win (or lose) this solitaire? How to express this multi-player card probability mathematically?